This days many startup are joining their hand with government and Police to ease off their task and make their work soother then ever. So Mumbai Traffic Police partners with city startup named Taskbob for handling Drunken Driving issues. Incepted in 2014, Taskbob is a reliable one-stop solution for on-demand home services. The platform provides instant, reliable and standardized home services ranging from plumbing, carpentry, electrical, home appliance repair, home and car cleaning to driver services. Akhil Sharma was in for a shock when he was stopped by Mumbai Traffic Police while driving home from work late last night.The constable at the nakabandi asked for his name and started scribbling something on a card. Akhil was not sure why he was being handed the ticket. He was pleasantly surprised when the card he was handed turned out to be a personalized voucher from Taskbob for hiring a chauffeur free of cost.Taskbob- Mumbai’s leading home servicesprovider collaborated with the Mumbai Traffic Police through this unique activity at the Nakabandis, to extend their Don’t Drink&Drive campaign called #ArriveAlive. 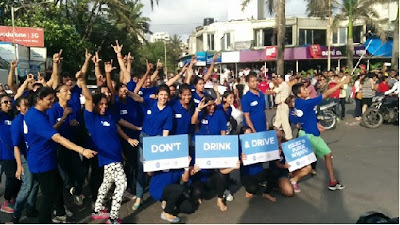 The campaign kicked off with a first of a kind flashmob, right in the middle of Carter Road, the Taskbob team danced away and shouted out slogans of “Don’t Drink & Drive”. This was followed by a shocker activity at the drunken driving Nakabandis on weekends. As cops stopped vehicles to check for drunken driving, Mumbaikars were surprised when the police asked for their name and then handed them a personalized voucher for a FREE driver for the night, with a message saying “ArriveAlive, Don’t Drink and Drive - Hire a driver”.Taskbob app let’s people hire a chauffeur in just a few taps, for as low as Rs80 per hour! Without interfering in the regular job of the traffic police, Taskbob team very effectively conveyed how everyone was working together only to get Mumbaikars home safely. So here all about Takbob and Mumbai Police drive making Mumbaikar more safe and taking initiative. Here all about it. Stay tuned for more. Thank you for reading.